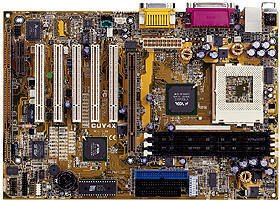 Asus is perhaps the most prominent motherboard maker around, they are renown for quality, stability and speed. The Asus CUV4X hopes to carry on the tradition, while using the VIA 133Z (essentially the 133A, except for Socketed processors) chipset. As with all Asus motherboards, the CUV4X is just a plain brown PCB. The CUV4X uses the VIA 133Z chipset which enables a few important features, these include native ATA66 compatibility as well as AGP 4X, and true PC133/133mhz FSB support. The CUV4X supports Celeron's and PIII's in PPGA and FCPGA form factors. The VIA 133Z chipset at the heart of the Asus CUV4X is cooled by a cheap thermal compound-less green heatsink. Confronted with these green heatsinks, it's almost a wiser choice to try and get a board with a glued on heatsink - at least that way, you know it is making contact! Supported CPU speeds on this little board range from 300Mhz (Celeron Mendocino) all the way to 1GHZ and beyond (PIII Coppermine). I guess Asus is planning for the future here, but this will probably end up being fairly redundant. There is also a jumper by the 3rd DIMM slot that enables Cyrix CPU support. 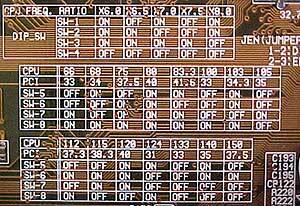 The main dipswitch allows you to manually set your CPU parameters (voltage and front side bus). Perhaps most importantly, the VIA 133Z chipset allows you to run AGP cards with 133Mhz FSB with relative ease since the VIA 133 series of chipsets are blessed with 1/2 AGP dividers at 133Mhz FSB and beyond.